There’s nothing like a fresh start — and it all begins with a spotless commode! Soft Scrub®’s bathroom cleaners are great for whipping your washroom into shape. Focus on these eight key cleaning areas and you’ll have your bathroom back to its original glory in no time. Dread this task no more! Keep your toilet bowl fresh by simply hanging Soft Scrub® 4-in-1 Toilet Care on the rim of your toilet bowl after a deep cleaning. Enjoy the deep-cleaning and deodorizing benefits 4-in-1 provides for up to four weeks. Use Soft Scrub® with Bleach Cleanser to get that deep-set grime out of the tub. Apply the cream cleanser to the walls of the tub, working the sponge from the top to bottom, and rinse with water. Use Soft Scrub® Mold & Mildew Stain Remover Spray to clean mildew stains from your shower curtain. 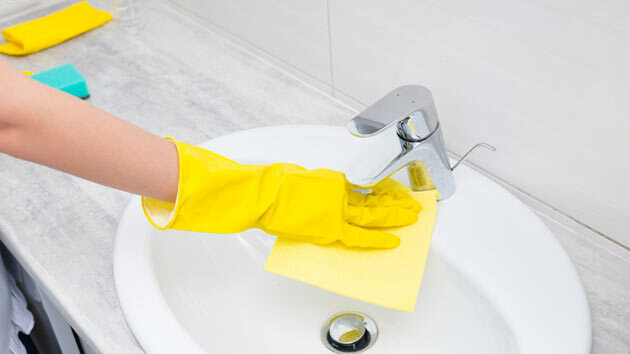 Wipe problem areas with a sponge and rinse for a shower curtain that looks like new. Resolve to keep toothpaste on your tooth brush this year. Use Soft Scrub® with Bleach Cleanser or Soft Scrub® with Bleach Cleaner Gel on your sink. Apply the cleanser with a sponge and safely scrub away to remove any stains. Use water for a final rinse. Wipe the laminate clean and keep your countertops looking spotless with Soft Scrub® Total All Purpose Cleaner Lemon Spray. Simply spray directly on to your laminate countertop and wipe away. Use Soft Scrub® Advanced Surface Gel to wipe the dust and grime off of your stainless steel and chrome fixtures and restore them to their natural shine. Eliminate any hint of guest traffic. Remove grime from your glazed ceramic surfaces with Soft Scrub® Total All Purpose Cleaner with Bleach. Just spray and wipe away for a spotless shine. Repeat these steps each week for an ongoing clean. Keep Soft Scrub® bathroom cleaner products nearby for any quick touch-ups, like a countertop swipe with Soft Scrub® Total All Purpose Cleaner Lemon Spray. •	Toss: For items such as medicine, makeup, lotions and potions: Throw out anything that that you know is past its prime. •	Sort: Organize drawers with trays or utensil organizers rather than stuffing everything into disorganized spaces. Make important items easily accessible. •	Store: Create storage for larger items that you don’t need daily and store them in large containers on nearby shelves.